Greenbooks guest post: how old is PJ’s Gollum? During the San Diego Comic-con Andy Serkis spoke extensively about his portrayal of the character Gollum. In doing so, he made some startlingly specific comments about the character’s age. Here, TORn guest writer Elpidha Lirgalad examines the implications, and reaches some very interesting conclusions about what it could mean for the Hobbit trilogy. These views are her own, and do not necessarily represent those of TheOneRing.net or its staff. How old is PJ’s Gollum? And what could that mean? Ever since the release of Peter Jackson’s The Fellowship of the Ring in 2001, some eagle-eyed fans have been asking why it appears that no time passes at all between Bilbo’s 111th birthday party and Frodo’s departure from the Shire. According to the dates that Tolkien gives in Appendix B of The Lord of the Rings, 17 years pass between Bilbo’s party in TA (Third Age) 3001 to Frodo’s departure in TA 3018. In between, Gandalf and Aragorn hunt Gollum, and Gandalf reads the scroll of Isildur in Minas Tirith in TA 3017 just before returning to the Shire to warn Frodo about the Ring. In the film, however, none of the hobbits have aged a day since Bilbo’s party. Even Pippin, who, using Tolkien’s dates, would have been 11 years old at the time of the long-expected party. Now, new evidence appears to confirm that Jackson always intended to remove this seventeen-year gap. Instead, he seems to have shortened it to merely the time it would take Gandalf to race to Minas Tirith and back to the Shire. This places the events of The Hobbit 60 years, not 77, before Frodo’s departure. 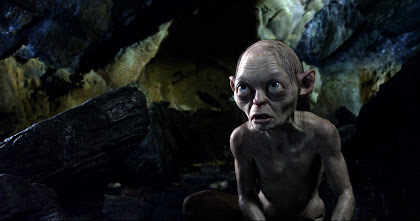 Gollum’s first appearance in the events of LOTR is, by Tolkien’s timeline, in the year 3019. If his encounter with Bilbo was sixty years earlier, it would have taken place in TA 2959, not the Appendix B date of TA 2941. This change could have a ripple effect for other characters and events, most notably Aragorn. According to Appendix B, Aragorn was born in TA 2931 and grew up in Rivendell. In TA 2956, “Aragorn meets Gandalf and their friendship begins,” and he leaves Rivendell one year later to begin “his great journeys and errantries.” To Tolkien, then, at the time of The Hobbit, Aragorn was 10 years old and living in Rivendell as Estel, without yet having any idea of his heritage. In The Two Towers Extended Edition, film-Aragorn tells Éowyn that he is 87 years old; since this scene takes place in TA 3018, film-Aragorn’s birth year matches book-Aragorn’s in Tolkien’s timeline. 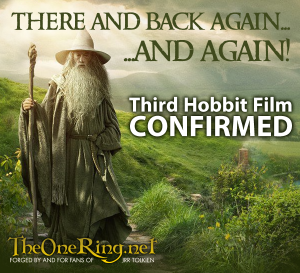 With the shift in dates referenced by Serkis, however, film-Aragorn could be 28 at the time of The Hobbit and could even have met Gandalf three years earlier and have already left Rivendell. Although there has been no indication of an Aragorn or Estel casting in The Hobbit, it is possible that he could be referenced in some way. If Jackson stays consistent with his own timeline, at the very least, we should not expect to see a ten-year-old Estel in Rivendell. Aragorn would be 28 and might even have already left Rivendell to begin his adventures. Elpidha Lirgalad is a Barliman’s regular and long-time Tolkien and Peter Jackson fan. She is fascinated by languages and is currently working on an advanced degree in second language acquisition.